In several previous posts we talked about the crucial role a windshield has for vehicle safety, and safe driving in general. Today, as is only to be expected, let’s talk about the issue of heavy snow or rain, and how that affects your driving experience. Also, for night driving, we will touch on the problem of glaring which is especially a challenge for people with glasses. Have you ever found yourself driving at night and the glare from other car headlights blind you? Have you ever wished that your car wipers worked just a bit faster during heavy rain? 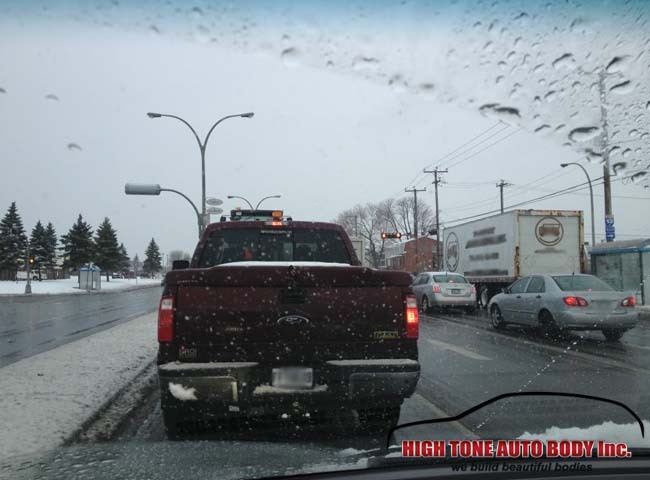 Do you have problems with snow pileups on your car windshield? Glaring, heavy rainfall and snow buildup are among the most annoying situations we face almost daily. Research shows that under heavy rain and snow, visibility significantly drops. Things get even worse at night. Thankfully, there is a solution to combat all three. Makes it easier to clear ice, snow, and even dirt and bugs. Helps reduce water marks and salt water residue. Lasts for months in normal driving conditions. The University of Michigain did a study to see how the Aquapel System helps to improve visibility during heavy rain and snow, as well as its positive effects on glaring. Using complex measurement systems the scientists discovered that the combined effects of water repellant and anti-glaring properties account for a 100% improvement in visibility when driving at night during heavy rainfall. 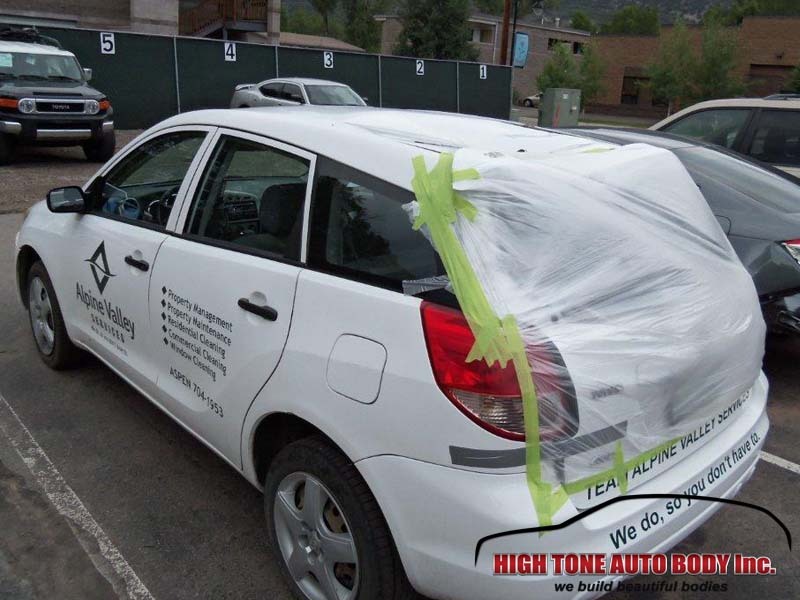 The High Tone Auto Body team is very experienced in Aquapel Application services, and our clients in the Aspen-Snowmass area say that we are excellent at customer care and high level of service. Experts say that everybody who has Aquapel applied to their car windshield has a safer driving experience: there is no glaring, no snow pileups, and any water or dirt just rolls off the windshield. Vehicles with Aquapel have 32% better chances to aviod a car crash than vehicles without Aquapel. Aquapel 2 months later and still working great for today’s wintry weather. This should be standard on all motorvehicles. I applied it about 6-8 weeks ago and I was driving in the rain yesterday without my wipers (except when going under 45mph). The slope of the Civic windshield helps, too. It never really wears away entirely it seems. Over time it becomes less and less effective (for example the water beads get larger), however, it keeps on going! Also as it gets older if the glass is dirty and you clean it or swipe the wipers over it to clean the glass, it restores the effectiveness a good bit. I’ve had it on for a while now, it’s still working pretty well! As you can see from the images provided below the rear end of the car is quite damaged and all that caused by a fallen tree. While parking under trees comes somewhat naturally, we should be careful how and where we park. A quick glance at the tree could have saved this car from such a damage. In order to fix this Toyota minivan and bring it back to its original state, we started by removing the rear window and the rear door. To protect the rest of the vehicle we covered the undamaged parts with protective sheets and performed the needed body work that covered straightening of the rear pillars and dent removal procedures to straighten the rear panels. All repairs were done by following factory measurements so that the restoration would meet original factory specifications. After the finished metal work and needed wiring repairs the Toyota minivan got a few coats of matching paint on the damaged roof section and the rear pillars. The door was deformed so our technicians performed the needed body work to insure proper opening and closing. After the metal work was finished the door too was painted with matching paint. After the paint job was completed, we mounted the new rear window according to factory specifications, mounted a new rear door lock (the original was damaged). We also replaced the rear wiper that was also broken. We connected the wiring for the wiper and plate lights and fine-tuned the door lock for proper locking. Lastly, we repaired the interior trimming to bring this minivan back to its pre-damage state. 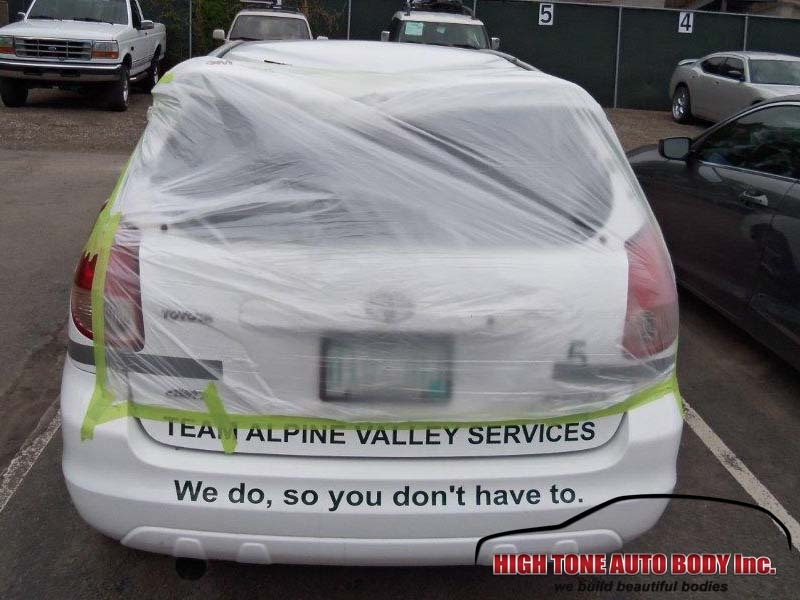 The Alpine Valley Services representative was happy with the speed and quality of repair work we did on this Toyota minivan. 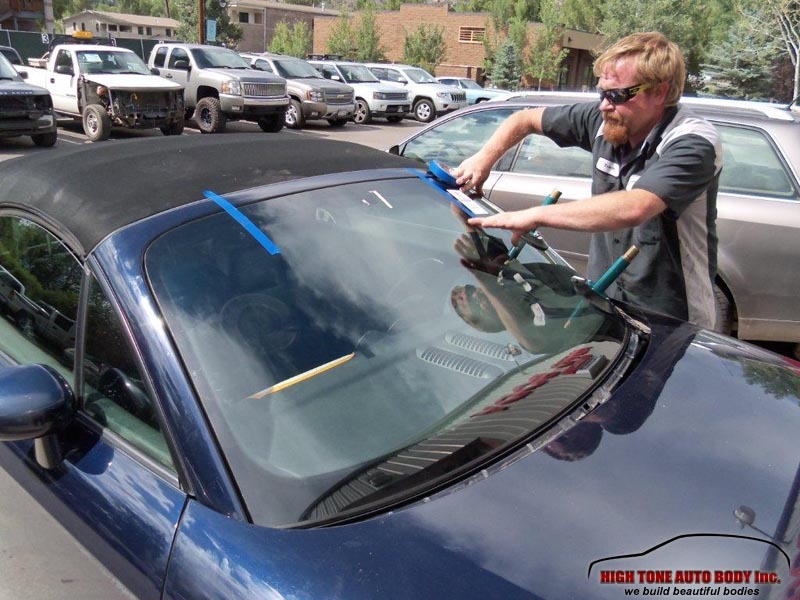 In the past few posts we covered a few stories on windshield replacement, how important the windshield is in the structural integrity of your vehicle, and how many windshield replacement services to a sub-standard replacement job. 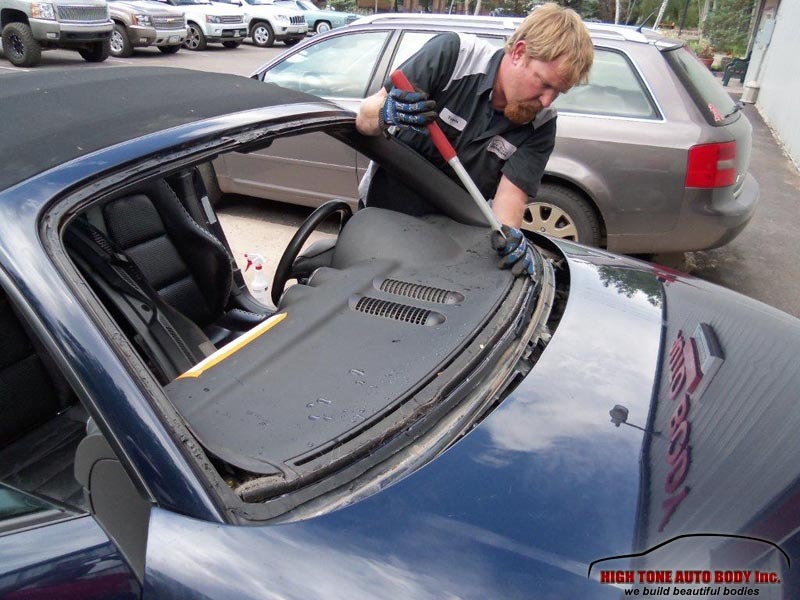 As we outsource our windshield replacement services to specialized workshops, it is our responsibility to make sure that every single vehicle that we handle gets factory-level quality of windshield replacement. For this reason, we often times monitor the replacement procedure. 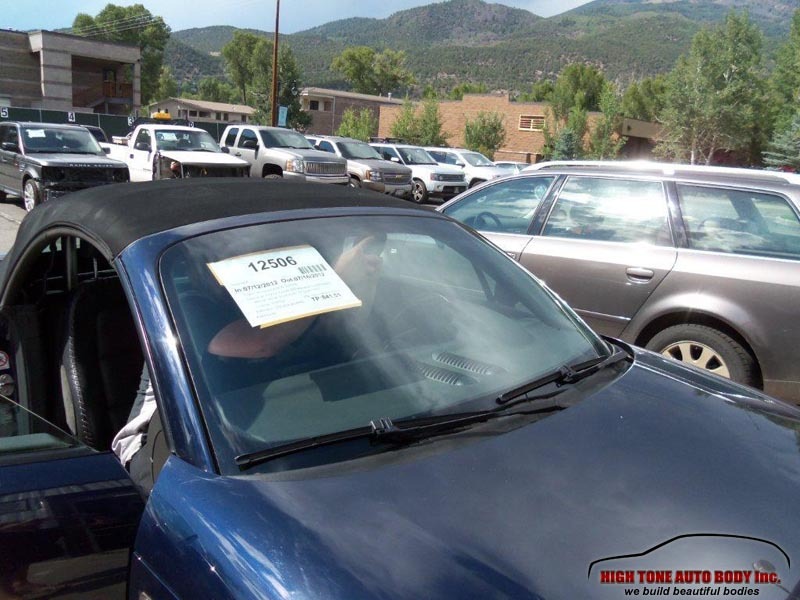 Most of the times windshield replacement technicians do an excellent job, but in rare occasions, some technicians skip a step or two in the industry-dictated replacement procedure. 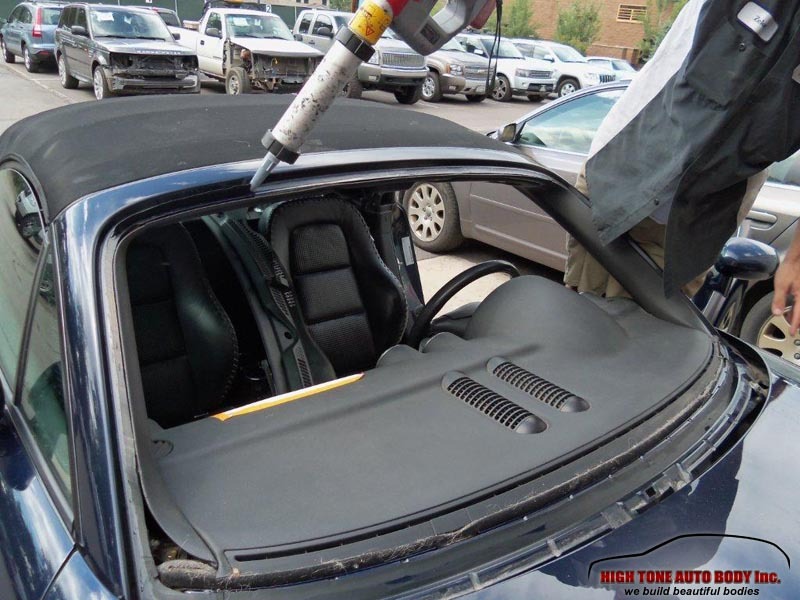 The windshield replacement procedure requires that the windshield gets treated with chemical solvents to clean up the contacting surface where the urethane glue goes. After cleanup, this surface must not be touched with bare hands so technicians must use medical gloves. 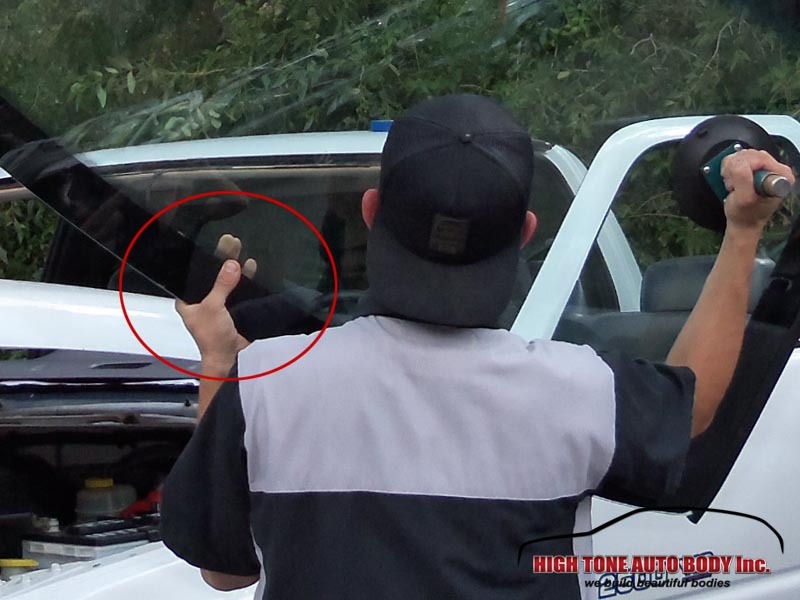 Some technicians have windshield carrying techniques that allows them to lift the glass without toughing the treated surface, but in some rare cases, the mind wonders off only for a second and technicians grip the glass without even realizing it. Unfortunately, this is all it takes to contaminate the contacting surface. Notice that the technician has gripped the windshield and touches the primed surface with bare hands. The black lining of each windshield is the contacting area where the windshield is glued onto the chassis with a urethane glue. As you can see on the image above, this technician seems to have forgotten to keep his fingers off the primed surface. 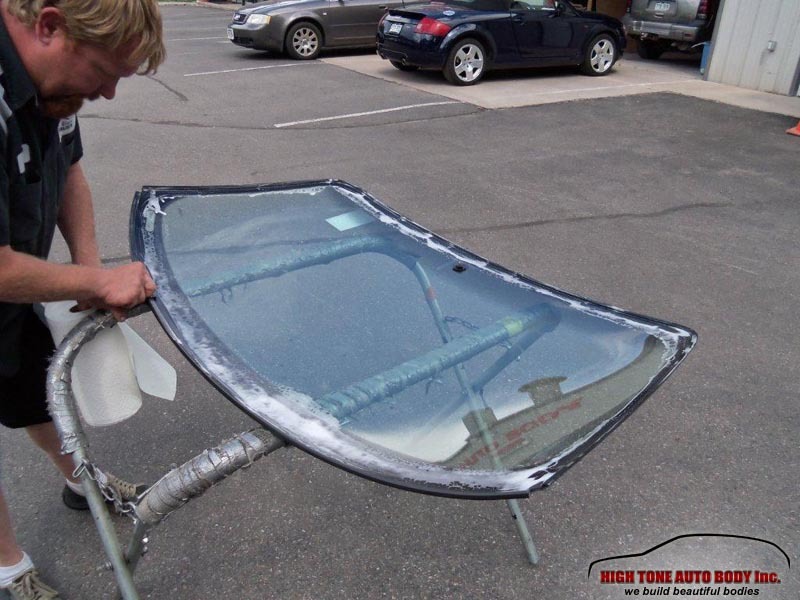 A bare-skin contact contaminates the primed surface and the dew and grease will prevent the urethane glue to form a solid bond with the new windshield. As the windshield carries almost 30% of the structural integrity during crashes or airbag activation, poor adhesion can result in blowing the windshield off the vehicle so the airbags will have nothing to bounce off and brace your face in a collision. The good thing is that we noticed this and stopped the technician. Since he was a certified technician there was no need of debating the issue. All that was necessary was a “Hey, the primed surface…your hand…”. His response was “Oh man… good eye!” He cleaned up the entire contacting surface, re-primed it and installed the windshield by the book. 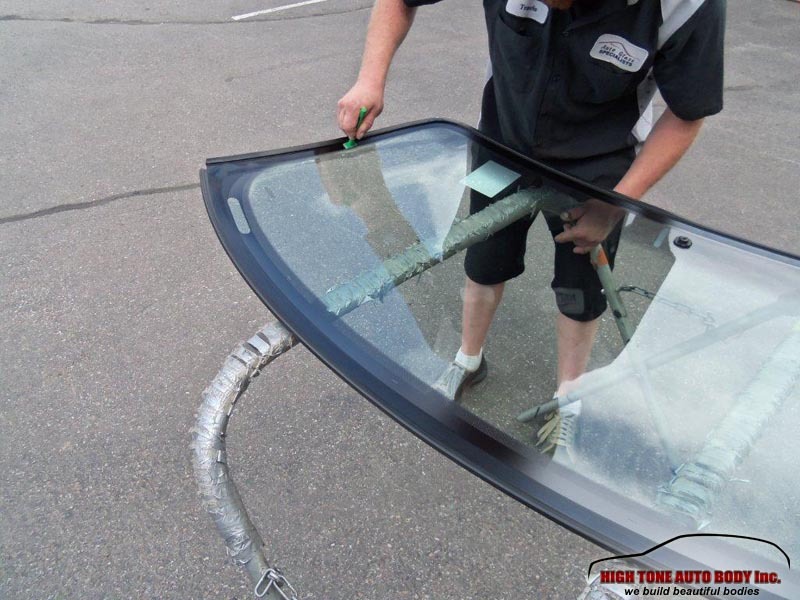 Most of the times, it’s the little things that make or break a solid windshield replacement. In this case, a drop in concentration could have resulted in a sub-standard windshield replacement service. 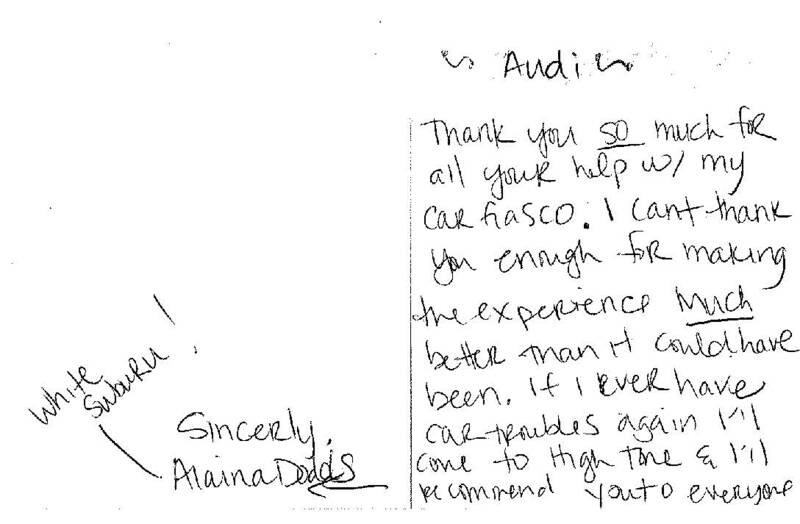 Thanks to our strong attention to detail, we pointed the technician of this unintentional error and our client got a factory-level quality of windshield replacement. Many people do not know that the glass in your vehicle is part of your vehicles safety and structural integrity. Glass is getting bigger and is covering more areas of the vehicles nowadays. All glass including the windshield, back glass and side glass are all important for keeping you safe in the event of an accident. Do not ever assume that all glass installers are alike or use the same quality products and procedures. For example an improperly installed windshield may not be able to withstand the blow of an airbag or it may have air or water leaks. 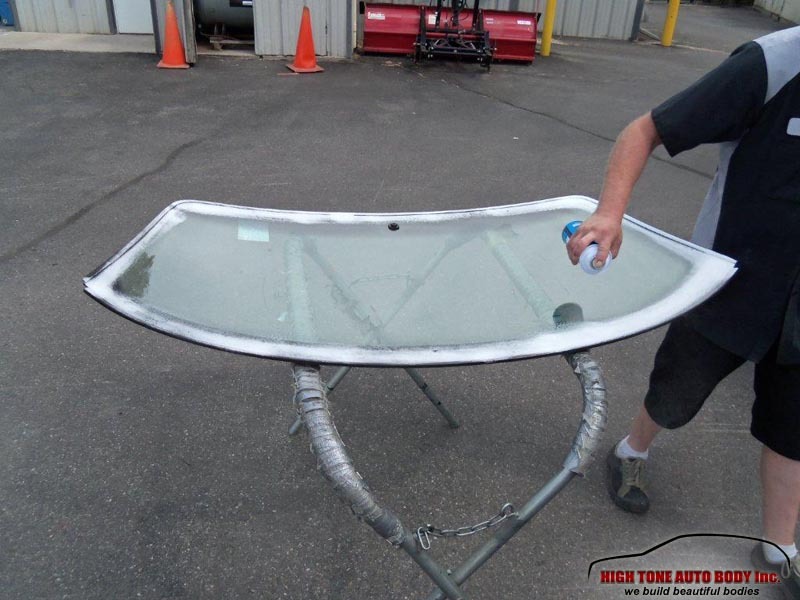 Once the old windshield is out of the metal frame which holds the glass in place it must be properly prepped and treated before the urethane is put in. Not only is the preparation of the metal important to prevent rust from forming and potentially spreading into the roof but the products used are equally important. 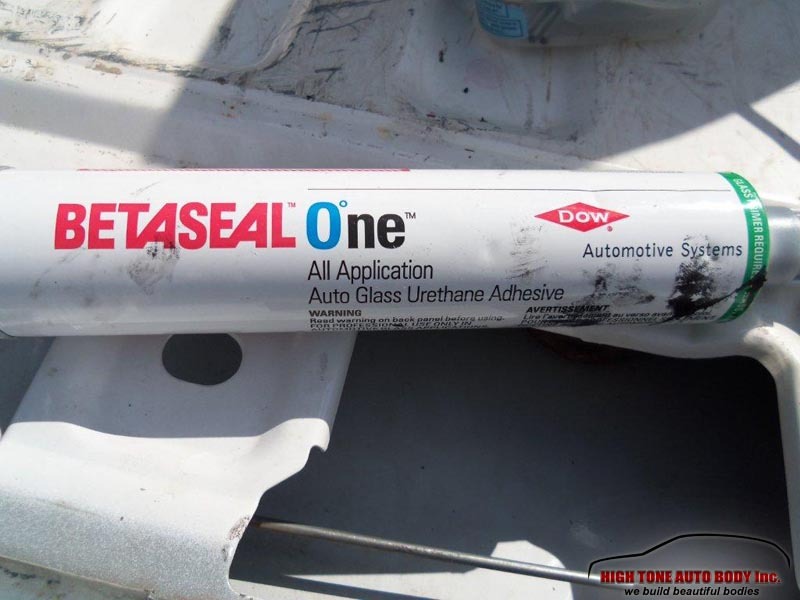 Some vehicles have electronics embedded in the glass, especially high end vehicles, if the installer uses the wrong urethane it can interfere with the vehicles electronics! A urethane that is non-conductive is a necessity when windshields or other glass contains radio technology, satellite navigation, heads-up display, rain sensor, heating and demisting, or even an electro chromatic system. Rust is much like cancer, once it starts it’s hard and sometimes impossible to stop. Attached are some photos of what can happen with a poor windshield installation. After many months or several years the rust will spread into the roof and cause the paint to crack, lift and chip off. This happens because of poor extraction practices, metal preparation, installation practices and poor adhesive products being used or a combination thereof.